Pictured from left: Lisa Carroll, Eva Spears, Eileen Jones, and Tammy Rote, all of whom volunteer their time and efforts at God’s Hands at Work. 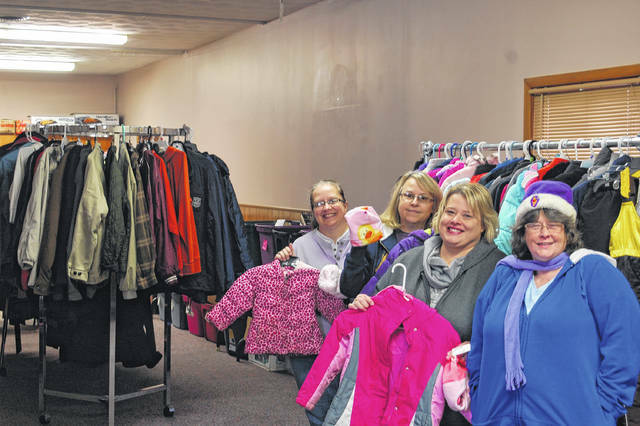 VINTON — God’s Hands at Work (GHAW) held a successful coat giveaway Monday evening. From 5-6 p.m. anyone in the public could come out and look through a collection of winter clothing. GHAW set up collection points at several local businesses around the county for several weeks leading up the the giveaway, collecting coats, hats, gloves, and any other items to help fend off the cold. “The community really rallied together and dropped off a lot of coats,” said Lisa Carroll, director of GHAW. Before the drive started, they had little more than a plastic tote full of coats. By Monday, they had over 25 totes full of winter clothing. This clothing giveaway is free to the public in all five counties that GHAW serves: Gallia, Jackson, Vinton, Meigs, and Mason Counties. There are no income requirements or restrictions to receive winter clothing at the giveaway. The event was set up with the coats on racks like a store so the public can come in an shop. Carroll and the team at GHAW have a passion for helping those in need, passing out hand ups instead of hand outs. A hand up helps someone get back on their feet during an emergency or hard time, explained Carroll. “A handout is kind of like continuing to enable different situations. A hand up is helping someone in a temporary hardship,” stated Carroll. God’s Hands at Work is open to the public three days a week – Monday from noon to 6 p.m., Wednesday from noon to 4 p.m., and Friday from noon to 4 p.m.. They normally provide a variety of items; clothing, food boxes, personal hygiene items, furniture, household items, and sometimes they can assist with financial needs in limited circumstances. To learn more about GHAW, call during their business hours at 740-645-7609.